The allegations that certain EVMs used in the recently concluded first phase of local bodies elections in Uttar Pradesh only allowed voters to vote for BJP have reached the UP High Court. Bahujan Samaj Party's mayor candidate from Lucknow Bulbul Godiyal moved the High Court seeking a speedy hearing into her plea for an investigation. Munqad Ali, a senior leader in the BSP and MP, confirmed that Godiyal has moved court and the party will campaign against this misuse of power. Samajwadi Party insiders also claim that they received as many as 80 complaints on the day of polling from different constituencies. These complaints have not been independently verified but Javed Ali Khan, a SP MP in the Rajya Sabha, says that party workers at several booths said that the machines were only voting for the BJP. Ashish Yadav, a SP functionary, says this time the whole episode was captured on camera. “Voters have become more vigilant now. Some of them captured this rigging on their cell phones,” he says, adding how it is strange that faulty EVMs only vote for BJP. In Meerut, where the seat was reserved for Scheduled Caste, Taslim Ahmad, a voter caught a malfunctioning EVM on his mobile phone camera. The video shows the light next to the BJP symbol of lotus blink when the button to vote for the BSP is pressed on the machine. “It happened in a Muslim-dominated neighbourhood. And for one hour, nobody paid any heed to his complaint. The police lathi-charged instead,” said Shahid Akhlaq, a former MP from Meerut and a prominent meat exporter, told Catch. There were similar complaints from booths in Kanpur. As these elections are conducted by the state government, Opposition parties are alleging that the BJP government is misusing state machinery. Rajendra Chaudhary, the Chief Spokesperson of the Samajwadi Party, said while the complaints have been brought to the notice of the State Election Commission, why is it that the EVMs had to be used without proper preparation when the polls could have been done with ballot boxes? A similar demand was made by BSP after the UP Assembly polls where the party had alleged widespread rigging in the EVMs. To add credence to these allegations, there were incidents of EVM malfunctions in Rajasthan and MP. For example in MP, an EVM brought from UP was found to be voting for only the BJP candidate during the trial stages. In the enquiry, it was claimed that the data from the last elections had not been deleted. Earlier, Raj Babbar, the UP state Congress chief, too, had taken up the matter during campaign for the party’s candidate in Varanasi. “Will the government go to the roots of these allegations? Is it premeditated? Will this also be hushed up?” he asked on Twitter, referring to allegations of rigging of EVMs in the polls. In Varanasi, he reportedly claimed that the BJP was attacking the democratic setup of the country and that it people’s suspicions over EVMs are not dealt with properly it will lead to anarchy. A senior RLD leader, says it is strange how there is steady flow of such complaints and they must be investigated. 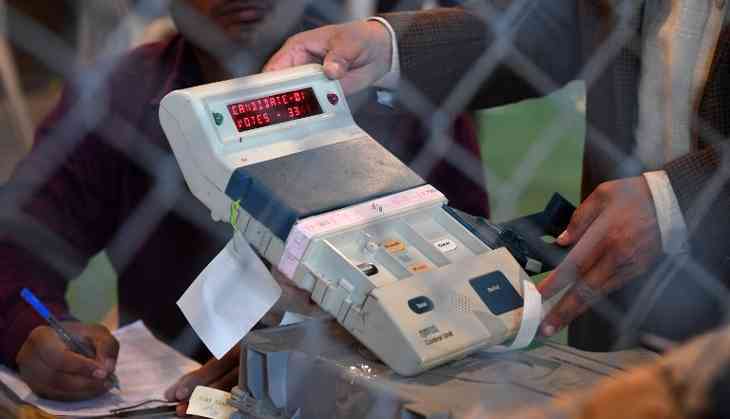 Under fire, the State Election Commission, while accepting that some machines were not functioning properly, steered away from allegations that they were only voting for the BJP. It has reportedly sought an enquiry report from the districts.